In addition to our rehabilitative services, we also provide permanent long-term care. Our compassionate care team, comfortable facility and familiar amenities help residents feel at home while receiving the quality health care they need. Semi-private and private rooms are available so that residents can still enjoy their personal space, and a large activity room allows patients to interact with one another and continue to enjoy a vibrant social life. 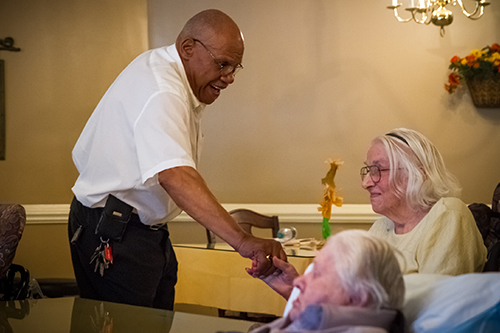 While Roanoke Landing proudly offers a wide range of amenities and home comforts, the most important thing to consider when choosing a long-term care facility is the staff’s interaction with patients. Our staff knows each patient by name and they are familiar with all of their habits. It’s one of the advantages of a smaller facility such as ours: intimate care and deep personal relationships with our staff. Roanoke Landing has many wonderful characteristics that make it extremely appealing to individuals living in Plymouth, Edenton, and the surrounding Washington-Chowan County area. We’re a smaller facility, so we are able to get to know each patient and resident and provide more meaningful, intimate care. Nearly 100% of residences are private rooms. 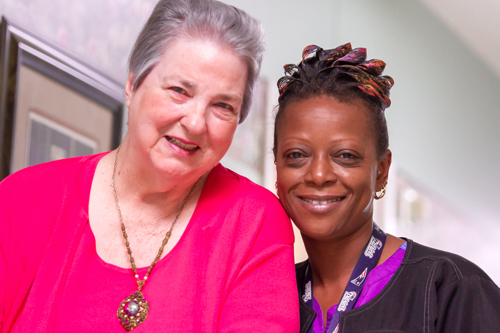 Many of our RNs & CNAs have been working with residents since we opened our doors. Time after time, our staff as well as residents tell us how much they enjoy working and living in our tight-knit community because of the reassuring and restorative family environment. Between our cozy location in the small town of Plymouth we share and our compassionate staff, a stay in the Roanoke Landing community is a stay with your neighbors away from home. Each aspect of our facility and every-day operation makes the Roanoke Landing lifestyle that of a community. Our location in the small town of Plymouth supports the comforting and restorative family environment of our community. Many of our staff have worked with us for more than five and ten years and always put the patients and families they personally know first. All of our department heads assist in dining according to their specialized training, and they do not eat until each of the patients have eaten. Roanoke Landing’s reassuring atmosphere creates a supportive environment in which patients heal as a community. Patients can choose to reserve their preferred seating in our furnished dining accommodations. Therapy does not happen only in specialized, secluded rooms, but also in patients’ rooms and common areas. Movies, events, and activities often take place in areas such as in the dining room and with our library resources to include residents as a community. Our décor, themed living areas, and always personal and accessible staff and resources offer Roanoke Landing the comforting familiarity of a place you know. We pride ourselves on being as accommodating as possible for our residents regardless of their mobility. We provide transportation services to and from doctor’s appointment for all of our residents. Wheelchair and stretcher transports are available for doctor’s appointments as well as planned activity outings. Non-emergency transports are provided by Coastal Medical Transport, Roanoke Medical Transport, and Bertie Ambulance BAS. Emergency and all in-county transports are provided by Washington County Emergency Medical Service.